Tanusree is one of the few female Sarodias amongst the younger generation today. She was born into a family where nothing mattered more than music and musicians. Her father, Dr. Saktipada Chatterjee, a well-known medical practitioner in Calcutta, was friends with Pt. 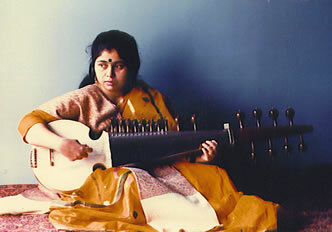 Radhika Mohan Maitra, the sitar maestro Pt. Nikhil Bannerji and several other famous musicians. Tanusree The Chatterjee home in Calcutta served as a meeting point in the evening for all musicians, who found every excuse to visit the good doctor for some homeopathic medicine and some excellent food served up by his lovely wife, along with some social and intellectual chit-chat. Young Tanusree was thus drawn into the fascinating world of Indian classical music even before she had taken her first steps. She started learning the Sarod at an early age under the late maestro Ustad Dhyanesh Khan, the son and disciple of the legendary Sarodia Ustad Ali Akbar Khan of the Maihar Gharana. After a few years, in the year 1979, she started to learn from Pt. Samarendra Nath Sikdar and moved over from the Maihar to the Shahjahanpur Gharana. She started performing on radio and television as a child artist and at the age of thirteen, competed successfully in the National Talent Search Competition to win the national scholarship in music. Appearing for the Sangeet Prabhakar diploma in music, she won the silver medal, securing the highest marks in the performance category. In addition, the Sur Singar Sansad institution in Mumbai conferred the ‘Sur-Mani’ title to her in 1993. Additionally, Tanusree has performed both in India and abroad in several music conferences. A few of the those that deserve special mention are the Swami Haridas Sangeet Sammelan and the National Center for Performing Arts in Mumbai, the Inter-Cultural School of Music in Venice, Note d’Oriente Festival of Indian Music in Ravenna in Italy, the Music Festival of Allen in Germany; Mandapa in Paris (France), the Holywell Music Room in Oxford, Leeds University and Nehru Center in London in the U.K. In 1996, she released her first solo album titled ‘Navras’ in England and also performed on an educational CD-ROM titled ‘Music of India’ in Paris. By virtue of her training in both Maihar and Shahjahanpur Gharanas, she has developed a style of playing that is distinguishably her own. Particularly notable is her perfection of the pitch of the notes and the overall tonal sweetness. In addition to music, she also has a passion for literature and holds a Masters degree in comparative literature. She lives with her husband near Calcutta and teaches English to children. She promises to uphold the traditions of this Gharana like her predecessors and pass it on in due course, to the next generation.